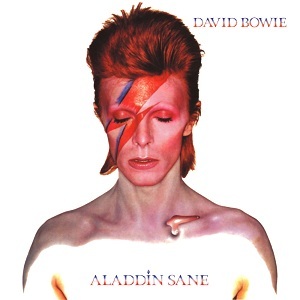 Atomic Sourpuss: A Godawful Small Affair: Five "Aladdin Sane"
COVER SHOT: Flash! Ahh-Ahh!... Oh, hang on; wrong act. Aaaand here comes the insanity. With Ziggymania safely runnin' wild from one end of the British Isles to the other, our hero went off to make waves on the other side of the pond and was seemingly transfixed by what he saw, leading to this album, which was apparently actually recorded in Britain but you get the idea. So Americana pervades this disk to a certain extent, but perhaps not as much as some would expect, as these songs are still deeply steeped in until-very-recently Swingin' London. "Drive-In Saturday" is the obvious example, with its depiction of a future filtered through 50's America ("Fallout", anyone?) still shot through with references to Jagger and Twiggy. In fact Jagger And His Stones' influence all over the bloody place here, not just on a cover of "Let's Spend The Night Together" which accidentally renders the original completely pointless. More than the good ol' U S of A though, this album carries the mark of a growing unease and malaise, with its tales of decadence and deriliction, ruin and rioting seemingly foreshadowing the mentally harsher times to come. Pick of the whole bunch for me is still "Cracked Actor". With burbling harmonica and a guitar that sounds like it's been plucked from a swamp, it sounds downright malevolent, dripping with the filth of the sleazier side of Hollywood. Elsewhere, everything gets knocked up a notch from the preceding album, not least the volume on many of the tracks. But the biggest notch-knocking-uption comes with the piano. Usually present in the sound of previous albums but relegated to a supporting role, the ivories are less tickled than pulverised by one Mr Mike Garson, whose not entirely conventional playing brings a new dimension to things, particularly with the breathtaking closer "Lady Grinning Soul" but also whilst helping Bowie explore his vaudevillian fantasies on "Time". Join us next time for... Well, we're not sure exactly WHAT it is, but it's there nonetheless.